Located centrally in the Hudson Valley, Rennie's is in the Town of Esopus, known for seminaries, apple orchards, vineyards and the home of the naturalist John Burroughs. In 1928, the Rennie family built a new home from a Gordon-Van Tine kit. John and Marion Rennie, brother and sister, lived in the house until 1988, when Jon and Adele Wagman, neighbors of the Rennies, bought the property and restored it. 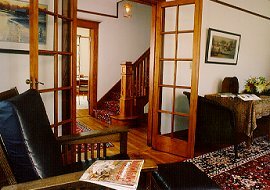 The house is representative of the time it was built with interior french doors, large windows, wood trim, a central hallway with an open staircase and several original light fixtures. There are many places to stay and lots of things to do in New York's historic Hudson Valley. Rennie's is a little different from many Bed and Breakfast places you may have found. If Rennie's is your first experience at a B&B, well, you are off to a good start. Rennie's is comfortably appointed with Mission style furniture and works by local artists and craftsmen. 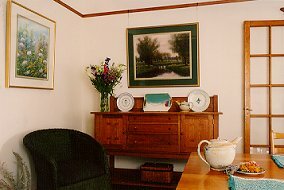 Nearly everywhere you will find pottery, paintings, photographs and prints by local people. And we have collected books by local writers. We can tell you where to find these talented people and more of their work too. 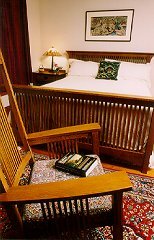 We have all the amenities including full breakfasts with family recipes and local treats from places nearby. There is an old apple orchard on the property, nice perennial gardens and within a short hike on a pretty road, Esopus Meadows, a quiet bay on the Hudson. We are open year round and Rennie's is a smoke-free home. Tea, coffee, soft drinks and snacks are always available to you. We have collected for you maps, brochures and directions to historic sites and other areas of interest. Your hosts are Jon and Adele Wagman. Rennie's is owned by Ed Heresniak and Marcy Wagman. For more information and reservations please call or write.